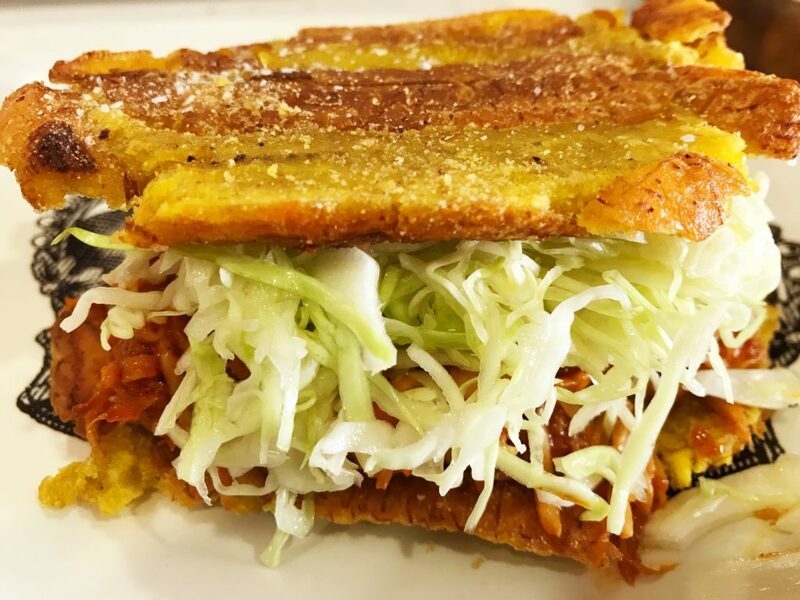 A jibarito (pronounced hee-bah-REE-toe), is a sandwich traditionally prepared with two large tostones ( fried green plantains) instead of bread, garlic-flavored mayonnaise and a filling of meet, cheese, lettuce and tomatoes. The word jibarito is a diminutive of jibaro, which refers to the people of Puerto Rico that lived in the mountainous countryside of the island. 2. Peel the plantains, cut them in half, then cut each half lengthwise. 3. 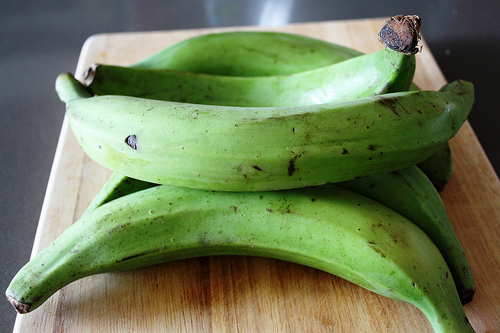 Fry the plantains until softened but not browned, for 5-7 minutes. 4. Remove from hot oil and drain on paper towels. 5. Flatten each piece to 1/4-inch thickness. This can be done with a large “tostonera” or the bottom of a heavy plate. 6. Re-fry in the hot oil for another 4 minutes until the plantains are crispy. 7. Remove from the oil, sprinkle with salt and set aside. 1. 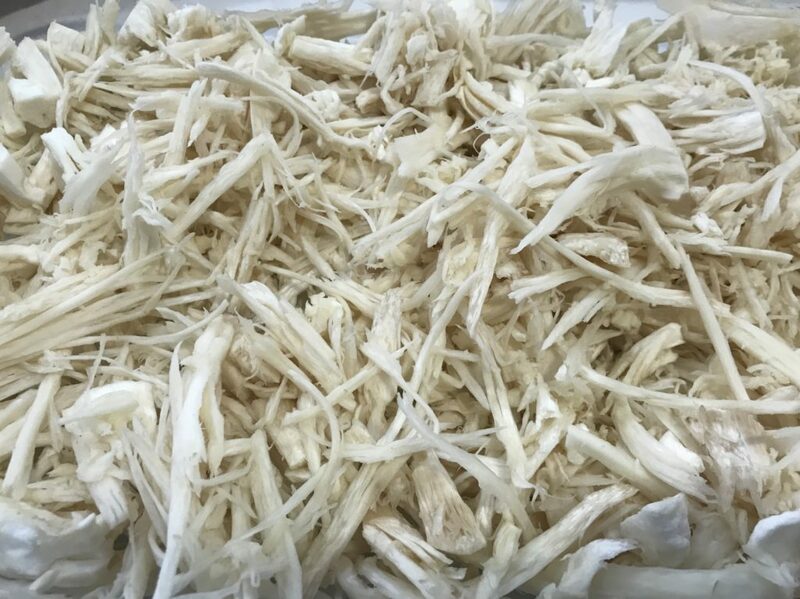 Use a fork to shred each of the king oyster mushrooms until they resemble the texture of pulled “pork”. 2. Coat the shredded mushrooms with the vegetable oil and peri peri seasoning. If you cannot find peri peri seasoning at your local store, mix one teaspoon of each of the following ingredients: Paprika, oregano, ginger powder, cardamon powder, garlic powder, onion powder and piri-piri pepper or cayenne pepper with 1/2 teaspoon of salt. 3. Put the baking dish in the oven at 350 ℉ for 30 minutes to dry the mushrooms out. 4. Warm a tablespoon of olive oil in a pan, and pour the shredded mushrooms into it. 5. Season with a decent pinch of salt and sauté. 6. Stir in the BBQ sauce until it’s mixed evenly through all the mushrooms. 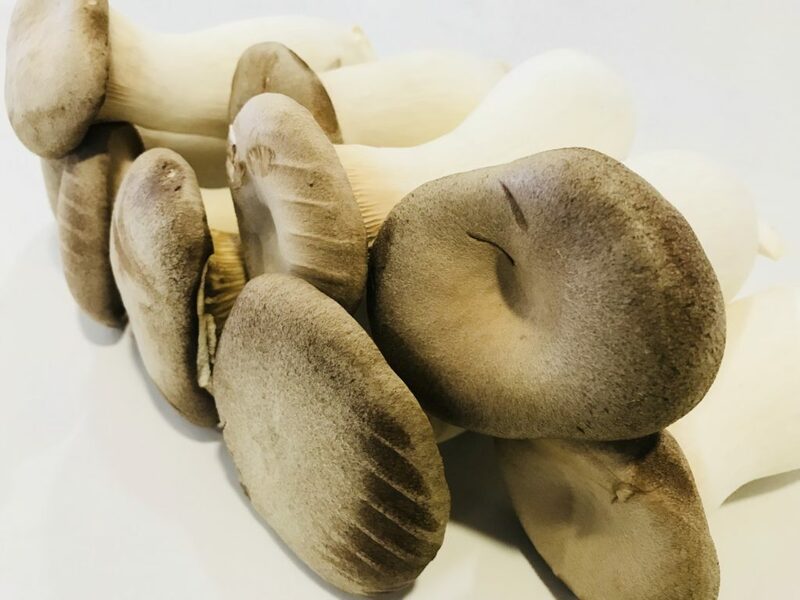 Place a couple of spoons of mushroom pulled “pork” on a slice of plantain, along with shredded cabbage or lettuce, tomatoes and garlic vegan mayonnaise. Top with another plantain to form a sandwich. Peel the plantains, cut them in half, then cut each half lengthwise. Flatten each piece to 1/4-inch thickness. This can be done with a "tostonera" or the bottom of a heavy plate. Re-fry in the hot oil for another 4 minutes until the plantains are crispy. 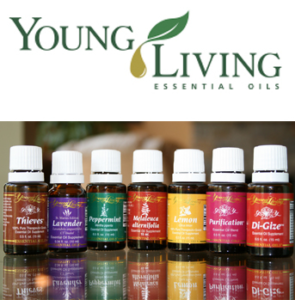 Remove from the oil, sprinkle with salt and set aside. 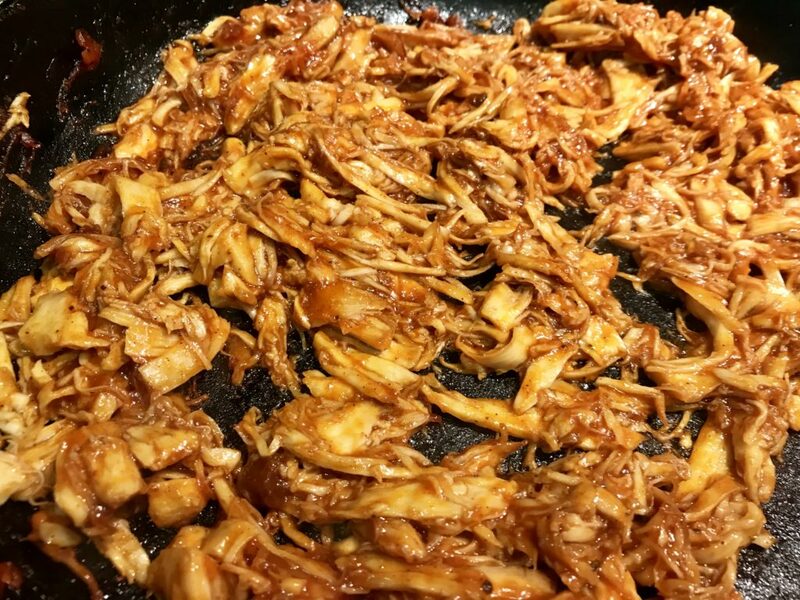 Use a fork to shred each of the king oyster mushrooms until they resemble the texture of pulled "pork". Leave in a baking dish. 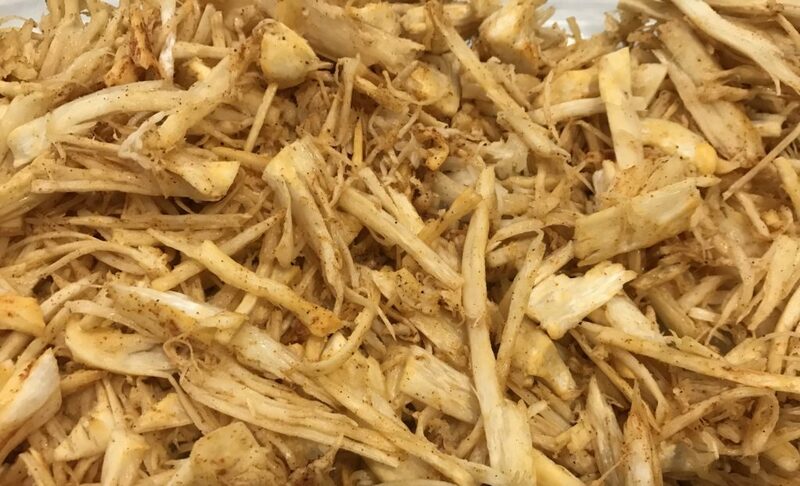 Coat the shredded mushrooms with the olive oil and peri peri seasoning. Put the baking dish in the oven at 350 ℉ for 30 minutes to dry the mushrooms out. Warm a tablespoon of olive oil in a pan, and pour the shredded mushrooms into it. Season with a decent pinch of salt and stir. Stir in the BBQ sauce until it’s mixed evenly through all the mushrooms. Place a couple of spoons of mushroom pulled "pork" on a slice of plantain, along with shredded cabbage or lettuce, tomatoes and garlic vegan mayonnaise. Top with another plantain to form a sandwich.